I fell asleep early on Thanksgiving night. Too many side dishes. Too many glasses of wine. Too many relatives. When I checked Twitter on Friday morning, it was clear I had missed a great conversation. Friends Colby Sharp, Katherine Sokolowski, Franki Sibberson, and Chris Lehman challenged each other to set goals and support one another for the next 50 days. Dubbed #nerdlution by its founders, this public commitment creates a community that encourages participants and holds them accountable. 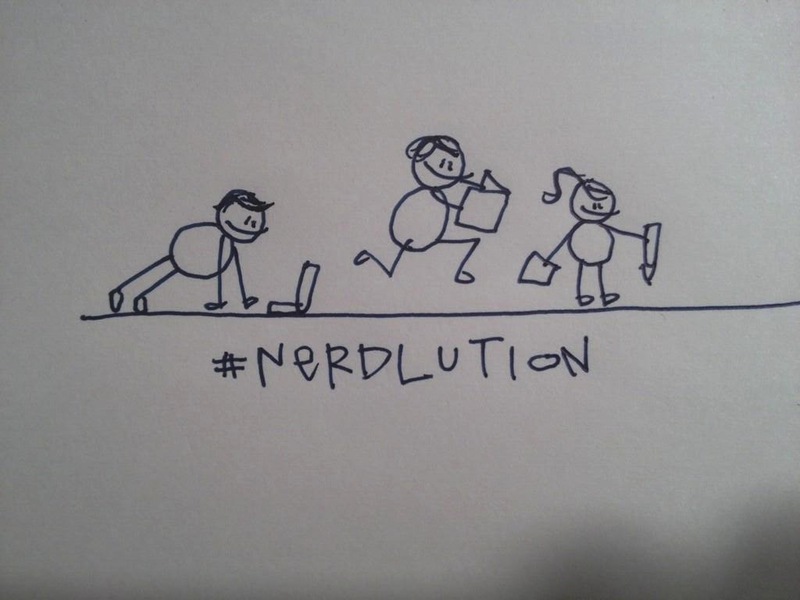 In just a few hours, #nerdlution tweets and posts popped up everywhere as bloggers and tweeps joined the movement. Yes! I should have goals. I can commit to walking more. My family enjoys our evening walks, but we lose our motivation when the thermostat rises above 90 degrees during the summer. We let our walking habit fall away for months at a time. Sarah, Don, and I updated our Zombies, Run! app and plan to run tonight. Running from moaning zombies in the dark. That’s motivating! I don’t like exercising, but I know I feel better when I do it. Besides, walking frees my thinking. Ideas for writing often bubble up when I spend time outdoors. I began my professional writing career as a blogger for Teacher Magazine. When invited to blog after a successful run as an “Ask the Mentor” columnist, I remember thinking, “I won’t tell them I don’t know the first thing about blogging.” Looking back, I think of “The Book Whisperer “blog as a column. I spent hours each week crafting essays about teaching and reading. Not casual writing–like I imagine blogging. I got my first book contract because of Teacher Magazine and I tried out a lot of ideas on the blog that later wound up in the book, The Book Whisperer. I found the blog limiting at times. I internalized a need to write about “big ideas” all of the time–poor education policies, new research findings, the sorry state of reading instruction. Sometimes, I just wanted to write about how much I loved Breadcrumbs by Anne Ursu. When Teacher Magazine and I amicably parted ways in 2012, I rarely posted anymore. By this time, The Nerdy Book Club was roaring along and I devoted my infrequent blogging impulses to our community blog. I was working on Reading in the Wild, and I felt urges to write something that wouldn’t pass through a copyeditor and production designer before anyone read it. Colby and Cindy still allow me a monthly spot and trust that I will turn in something decent. I know I give them heart attacks because I usually begin my posts three hours before they are due. Nerdy is a good place for me–I can tie anything (and I mean anything) back to reading. I can talk about my students and our shared book love. It’s a nice home for an itinerant blogger. Nerdy doesn’t give me everything, though. I still like questioning education policies. I still like the immediacy of writing when I am inspired. Six years as a “blogger” and I, Donalyn Miller, have never had a blog that is completely mine. Looking at the blogs of dear friends and colleagues, I am confident every topic I might explore is in good hands, already. Teri Lesesne switches between education policy rants and book reviews on two different blogs. Katherine writes beautifully about her classroom. Colby and John Schu celebrate books and the authors who write for young readers. The world doesn’t need me to blog. I miss opening my brain and my browser and putting something out there. I miss working my way through seedling ideas. I still don’t see myself as a blogger, but I can make a #nerdlution to try. This entry was posted in #nerdlution. Bookmark the permalink. Congratulations on your blog! Welcome to the #nerdlution. I’m so glad you’re here. WOOOHOOO! So happy you have your very own blog!! Love your writing and so happy about this! Congrats! I find having a personal blog very liberating. I hope you enjoy your new endeavor. I love having a place to write. I’m so glad you have started this one. Blogging has given me, a classroom teacher, a place to reflect on my teaching, share what I’m doing, rant a bit and write about my 6 cute grandkids and one spoiled dog. I hope you find yours to be a safe place to share anything…. Totally awesome. Can’t wait to read. I’ve been blogging since the birth of my son over eight years ago. Over the course of those eight years I believe only my 90 year old grandfather regularly reads. And you know what, he brings it up every time I see him. That alone is enough reward for me! Yes, the world does need you to blog Donalyn. You are wrong. The world does need to read a blog by you, you make a difference with your words and I can’t wait to read more of them. I am so excited to follow your blog! I actually started my own blog as part of #nerdlution. Blogging is a great creative outlet! Liking forward to blogging along side you! I’ve been away from my blog on a daily basis for way too long. Given #nerdlution and a great photo challenge, I’m back in the mix. Easy to stay in it with Twitter chatting it up. I’m so excited you have decided to share your thoughts on a consistent basis. And is there a rule that a blog has to be about one thing? Hope not. Enjoy sharing. We’ll enjoy reading and commenting.